This recipe is from Teresa Ulrich at the Pearl Bakery, in Portland, Oregon. Make the streusel: Process all six streusel ingredients together in a food processor until loose, fine, sandy crumbs form. (Don't overprocess, or the streusel will get too clumpy.) Store in the refrigerator until ready to use. 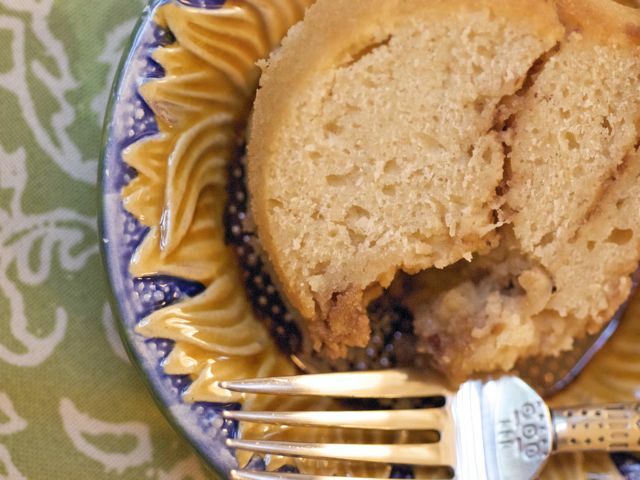 Make the cake: Sift together the flour, baking powder, and nutmeg. Cream together the butter, sugar, and salt with an electric mixer until very light and fluffy. Add the eggs, one at a time, beating well after each addition. Add half the flour mixture to the creamed mixture and mix on low speed until just incorporated. Add the milk and vanilla and mix on low speed until just incorporated. Add the rest of the flour mixture and mix on low speed until just incorporated. (Don't overmix, or the cake will be tough.) Scrape the bowl bottom and sides with a spatula and use a folding motion to thoroughly blend the batter. Assemble the cake: Coat a 9-inch tube pan with butter or nonstick spray. Transfer a third of the batter into the tube pan. Spread the batter evenly across the bottom of the pan. Sprinkle ½ cup of the streusel evenly over the batter. Transfer another third of the batter into the pan, spreading evenly. Sprinkle another ½ cup of the streusel evenly over the batter. Transfer the last third of the batter into the pan, spreading evenly. Sprinkle the top with ½ cup of the streusel, adding more if needed to evenly cover the surface. Bake the cake: Bake at 350 degrees for 50 minutes, or until a small knife tester comes out clean. Cool in the pan for 15 minutes. Remove from the pan and finish cooling.